(A) A silent film, music added fan film from 1967. Star Trek: The 8mm movie: http://www.break.com/usercontent/2010/5/29/star-trek-the-8mm-movie-1848482 (2:59). No plot. Sound is music added later. Without regard to what I am about to say, this film is historically important, and as such has value. Rating: 1. Any film written by a ten-year-old and which has ten-year-olds playing the lead roles is going to have issues. Here, there are also times when the sound makes it impossible to tell what is being said. Also, the roughness of the video or casting the same person dressed the same way to play two parts makes telling who is who very difficult. It is only 8 minutes long, and the story has no motivation. Some aliens grab and attack for no apparent reason and are defeated. I do not adjust my rating for age, budget, etc. So, I have to say the writing is fair to poor. I give the kids a point for acting, and the sets are also basically fair to poor, except the sick bay, which is pretty good. The special effects do the job, so they get some credit for that. Because it was impossible to follow, I can't say I found it well directed or entertaining. It was, however, tightly edited. That gives it about 2.75 of a possible 8 points, which would be a 2, if I could have followed the sound throughout or knew who I was watching. It is the bad sound and impossibility of knowing which characters are Star Fleet and which are aliens that drops this to a 1. Thansk for the link to this. I didn't understand the plot. But everything looks great for the time and ages of all involved. 10﻿ years old and achieving this is amazing! I love the transporter effect and shields being hit! (C) Ray Gasser's 1971 Star Trek Fan Film. 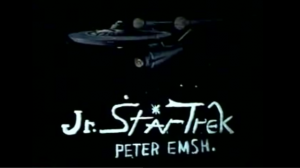 "My College Star Trek Production from 1971"
Both the 1967 and the 1969 Jr. Star Trek films predates this. It does not tell a complete story. It uses footage from the professional Star Trek TV show, which appears to be screen capture. http://www.youtube.com/watch?v=F4xeXN2MgLo&feature=related (6:26) (moved here from Really, really bad stuff). Vic's Vintage Voyages (1973-1975) (all appear to be silent, 8mm film, with sound added later. Vic has been kind enough to confirm that Vic is Kirk.). A parody animation. Began filming in 1974. Unfortunately, the website seems to be all about the making of Star Trix and not the watching of Star Trix. Star Trix is itself considered a classic in many quarters, and is among the earliest fan films, possibly the earliest fan film animation, ever made. (I) Paragon's Paragon, The filmmaker, John Cosentino, say it was filmed in 1975, (although I've seen others say other years). It is listed under films I cannot offer a way to view. It is (C), here: http://startrekreviewed.blogspot.com/2009/06/213.html. The original film was one hour twenty minutes. Spoof by 4 high school friends using paper cut-outs and stop-motion animation. Originally silent, Sound added in 2005. (M). My Childhood Star Trek Fan Film (1970s). Shot on Super-8, transferred to VHS, then to YouTube. https://www.youtube.com/watch?v=VeO7qkqMwAM(4:28). (O). "Through Poetry of Melchizedek," https://www.youtube.com/watch?v=9XfJt-j5atk (1:43). A Fan-Made film trailer from 1975. First posted (released) January 9, 2019. (P). Star Trek https://vimeo.com/313322331? (10:16) from Kevin Carney, titled simply, No props, sets or costumes, just teenagers role-playing. Undated but surfaced on Vimeo, Jan 26, 2019. (Q). Star Trek (1976, posted 2017), from bruchorama, https://www.youtube.com/watch?v=_t01n4_j9tE (6:53). (S). Star Trek outtakes from Bruchorama. Although the title says these are outtakes, it appears to be a full 8mm home movie from a star trek fan film made in 1976 in Minneapolis, MN. https://youtu.be/xCBT0Zsm5IQ (8:53).